Conventional rocket fuel—mostly ammonium perchlorate and aluminum—is difficult stuff to come by when you're on, say, the Moon. So we'll need to develop flexible alternative fuels if we ever want escape the backwoods of the solar system. Luckily, NASA's green engine test rig, the Morpheus Lander, is doing just that. The Morpheus Lander is an R&D vehicle stationed at the Johnson Space Center in Houston, Texas. It was developed entirely in-house by NASA engineers and grew out of the failed Project M—an Armadillo Aerospace project intended to put a Robonaut 2 on the surface of the Moon. The Morpheus test regimen puts prototype green-fuel engines through their paces while simultaneously developing Autonomous Landing and Hazard Avoidance Technology (ALHAT) for future robotic spacecraft. Its primary focus is developing the technology and command systems necessary for a successful, fully autonomous Lunar descent. "Anything similar to this was when Neil Armstrong flew a lunar lander prototype at Ellington Field in the late 60s," Matt Ondler, project manager for Morpheus, told FoxNews.com. Now, this isn't simply a rocket engine tethered to a pole. 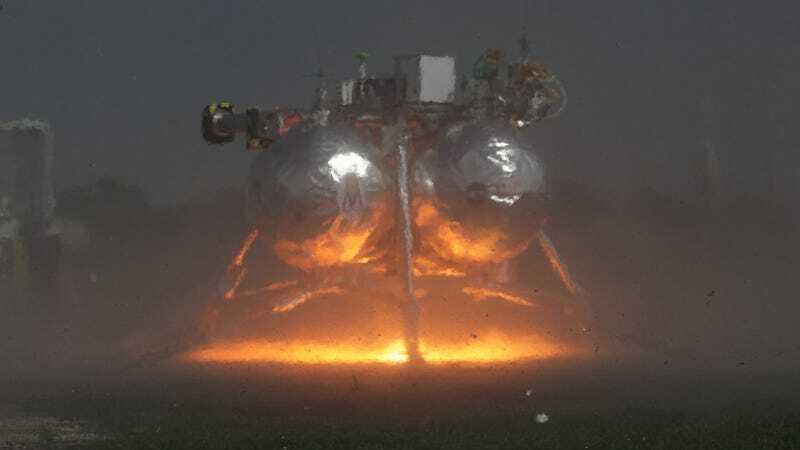 The Morpheus Lander is a full-fledged spacecraft, roughly the size of a Cadillac Escalade. The craft can transport a load of up to 1,100 pounds (conveniently, just enough to port a Robonaut 2). Morpheus' engines run on a mix of liquid oxygen and methane, which, in addition to providing ample thrust, are common throughout the solar system. As Ondler explains, "You can make the methane from water on the moon; there's lots of water trapped in craters on the moon. So that allows you to not carry all of your fuel with you. You can arrive at a planet and make fuel yourself on the surface."